4K video is still in its infancy, but Mac users are clamoring for high-resolution external displays. Many Macs have the ability to drive a 4K display, but it’s not easy to get it to work with older hardware. 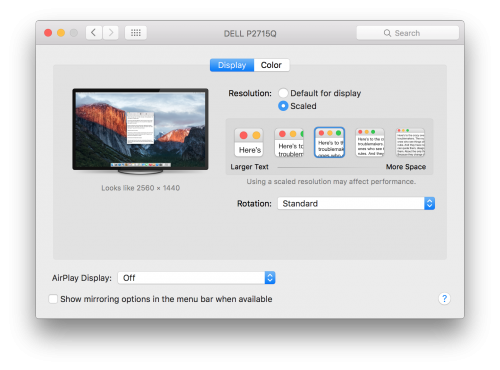 Here’s how I connected a 4K Dell P2715Q display to may 2012 Retina MacBook Pro, one of the first 4K-capable Macs. TL;DR: Yes, the Original rMBP Does 4K over DisplayPort and HDMI! If you’re reading this, you likely have a 2012 Retina MacBook Pro and want to know if it supports an external 4K monitor. The short answer is, yes it does! The real answer is a little more complicated, though. 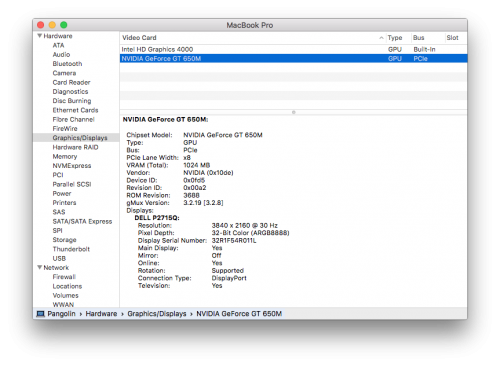 Fact: The 2012 Retina MacBook Pro’s Nvidia GeForce GT 650M with 1 GB GDDR5 memory can drive 4K resolution (3840 × 2160)1 and the HDMI and Thunderbolt Mini DisplayPort 1.2 ports can output this video signal. You can drive a 4K “Ultra HD” display with this machine. You must have Mac OS X “Mavericks” 10.9.3 or later. Prior to this, the Thunderbolt/Mini DisplayPort connectors weren’t capable of UHD resolution, and text didn’t look great because it wasn’t scaled properly. The HDMI port is capable of driving a 4K monitor or TV, but only at 30 Hz refresh rate. This is usable for text but not so great for games or video. 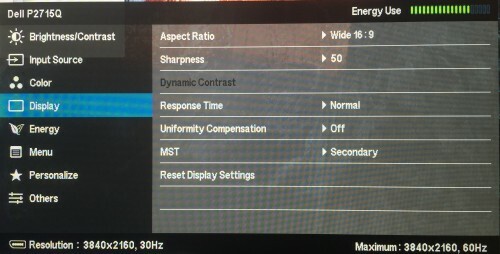 The two Thunderbolt/Mini DisplayPort ports can drive 4K at 30 Hz using MST, but your monitor might not auto-detect this or might require special settings (like my Dell). Mac OS X will default to “Scaled” (looks like 1920×1080) when connected to a 4K display, and this is pretty jumbo-text for a 27″ desktop monitor. So it’s not “plug and play” easy for most people. If you’re like me, you’re going to plug a DisplayPort to Mini cable into the monitor and your Mac and be disappointed when it shows up as a 2560×1440 display, complete with chunky pixels. Then you’ll try the HDMI port and see that it does work. Then you’ll use The Google, find this article, tweak your monitor and your Mac, and have something that pretty much works. Then all of this will be moot when the Skylake MacBook Pros come out next month and you upgrade to something that can drive 4K natively over DisplayPort at 60 Hz. Although Apple still doesn’t sell a standalone 4K display, Mac OS X and Apple’s new hardware are both pretty much ready for them. This is no surprise, since Apple has pioneered high-DPI displays, from the MacBook Pro to the Mac Pro and now the iMac. Pretty much the only thing missing is a 4K monitor for all these machines to drive! Ironically, there are a ton of 4K monitors over in the PC world even though Windows still doesn’t do as smooth a job driving them usably. So Mac owners are looking at PC hardware makers like Samsung, Acer, and especially Dell to provide a monitor. I selected the Dell P2715Q for my Mac. It’s a quality monitor with many great features and is amazingly affordable when buying through a reseller like Adorama or Amazon. Mine was a special from Adorama on eBay – just $429.99 shipped! Their normal price is a still-affordable $519. It arrived as-promised, new and in the original box. I was confident, having bought camera gear from Adorama in the past, but am glad to reassure others that they’re legit. All in all, it’s an amazing monitor. And it’ll be even better once I’ve got a machine capable of driving it at 60 Hz! As I mentioned above, there are a few gotchas when connecting the Dell P2715Q to an older Mac like my 2012 MacBook Pro with Retina Display. HDMI works pretty well out of the box, but you’ll want to manually set the display resolution to something better than 1920×1080 on a large panel like this. Go into System Preferences, select Display, and then Scaled. I recommend the center item, “looks like 2560 x 1440” as a nice compromise. If you’d rather use DisplayPort, it is possible but requires a tweak to the monitor. The 2012 rMBP supports DisplayPort 1.2, which apparently can’t do UltraHD resolution on a Mac. But it is possible to do it using Multi-Stream Transport (MST), which combines two DisplayPort signals on one screen. The Dell P2715Q, however, has MST turned off by default. Now the Mac and the Dell monitor will negotiate a full 3840 x 2160 signal! The Dell P2715Q is easily the best value in a 4K monitor today. It has a quality panel and excellent input support, plus a built-in USB 3 hub. Although it’s not perfect when paired with an older Mac like my 2012 Retina MacBook Pro, it does work with a bit of tweaking. And I look forward to using this monitor with future Macs!